On the Spring equinox I came home from the library to find my flat occupied by someone else. The plants were the first sign of intrusion: succulent and cacti seedlings pulled off their sunny spot on the living room windowsill, soil all over the floorboards, stems broken, tiny fleshy leaves strewn around like beads of jade. Mice? I thought, staring at the scene in confusion. Then the clattering in the kitchen started. I pushed the door open, anxious of who or what I would find. A pair of black wings flapped back at me, perched on the tall tap of the kitchen sink. 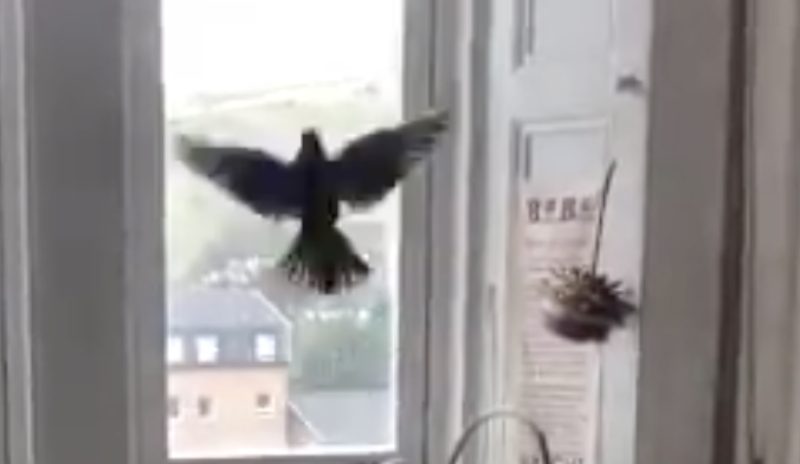 The bird was panicked, flighty; it (I’m not sure of its pronouns) seemed to notice my presence in the doorway and quickly launched itself at the closed window with a dull thud, its wingspan sending a colander skidding to the floor. In the smallness of the room it seemed huge, powerful. The human trappings of my kitchen looked quaint in comparison – full of silly, disposable toys that the bird had repurposed as its temporary environment. I wondered if the bird would be calm enough to let me approach and open the window; then I remembered that ours are ancient, and only open about a hand’s width at the bottom. Even if I did manage to get past and open it, the bird might be too stressed and disorientated to find its own way out. I was going to have to put it out myself. I backed out and pulled the door to. I stood in the hall for a few seconds, pulse accelerated and my thoughts swamped by a feeling of uncanniness. Birds belonged outside, I belonged inside – seeing the bird on my kitchen counter felt real but scrambled, a glitch in the programme. The only other thing I remember feeling was the shock of the immediate present; unlike work or emails or house chores the bird had to be attended to in that precise moment, and couldn’t be put off until later. A sharp slap of imminence to the face, like queuing outside an exam hall and knowing that procrastination is no longer an option; time isn’t an elastic you can stretch at will. No – I had to sit the exam then and there, and attend to the guest. I took my coat off then put it back on again. Scenes from The Birds flickered in my mind as I grabbed a towel from the bathroom and wrapped it around my neck and head, leaving room for the eyes. Would the bird be distressed enough to attack me, I wondered? The kitchen door creaked as I opened it and reached for the oven glove (we only have one), and covered my other hand with a tea towel. One voice in my head said I don’t want to take any chances and another replied you’re being ridiculous. No time to self-criticise. I’d opened the window and was at the sink, gripping the bird’s body with both hands before I realised I’d moved. The wings were stronger than I’d thought and one flapped free as I tried to manoeuvre it to the window. A black clawed foot swiped through the air. I only had half of the bird in my grip now, the other half struggling wildly to escape. I remember saying “sorry”, out loud, then realised I’d been making cooing and hushing noises since re-entering the room; for the benefit of the bird or myself I’m not sure. We struggled by the window for a moment, and then the bird sensed fresh air and scrambled out of my hands to freedom. Even though I had felt the power of its wings in my hands, I was still surprised when it didn’t drop straight to the street below, but soared coolly over the flats opposite. I reread the letter and felt myself nodding along, this time with a fresh dose of reality. Like Tom, my dreams at one time had also been full of intruders, scaling walls and drainpipes and breaking down doors. My body knows that visceral fear. But then, as Daisy replies, wouldn’t the real nightmare be a house ‘genuinely made safe from intruders - impregnable - all entrances and exits sealed up’? No one can have it both ways: the songbird also shits along its many lines of flight. Life in the species borderlands isn’t always neat, or easy – but it’s better than pulling up the drawbridge. Daisy Lafarge is a writer, artist and editor. This postscript marks the close of Issue #49 Couldn’t we just bee?, Daisy’s departing editorial season at MAP.